At the Angela Grant School of Dance, we believe that children respond positively to learning ballet in many different ways. Children intuitively enjoy expressing music through dance – that’s the fun bit! However, we aim to educate as well as entertain and to that end we set clear goals. 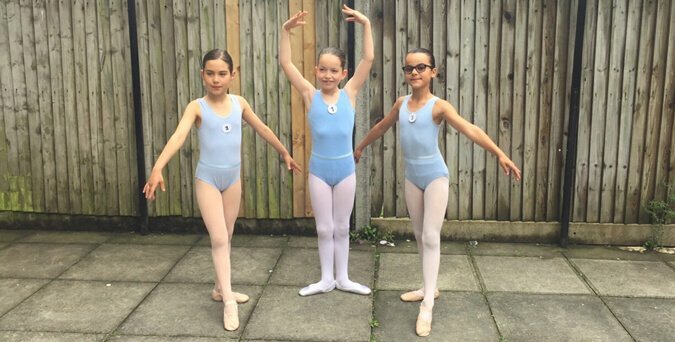 We base our lessons on the Royal Academy of Dance syllabus and so, for those that choose, children can take the Royal Academy of Dance grades. Some ballet schools believe that exams create an unwelcome pressure on children - this is not our view. Our experience is that children enjoy the challenge of exams when set in an enjoyable environment, though this may be helped by the fact that our pupils have always passed! The Royal Academy of Dance syllabus has been carefully crafted to develop coordination, strength and grace, all within a formal ballet structure. So what children learn with us is exactly how professional ballerinas start their careers. Moving up through the grades gives children real satisfaction in their achievement, as well as obvious pride in their art. Angela Grant (RAD RTS) is one of a trio of performing sisters, namely Rebecca Grant (Holby City) and Rachel Grant (Die Another Day). She was trained with her sisters from an early age by Miss Nora Morrison MBE at the Nora Morrison School of Dance in Nottingham . She went on to train at the prestigious Elmhurst Ballet School and then at the London Studio Centre. Copyright © 2019- The Angela Grant School Of Dance. All rights reserved.